In large bowl, beat Cake ingredients with electric mixer on medium speed 2 minutes, scraping bowl occasionally. Pour into pan. Bake 26 to 33 minutes or until toothpick inserted in center comes out clean. Cool on cooling rack 5 minutes. With handle of wooden spoon (1/4 to 1/2 inch in diameter), poke holes almost to bottom of cake every 1/2 inch, wiping spoon handle occasionally to reduce sticking. In large bowl, beat Filling ingredients with whisk 2 minutes (mixture will thicken). Pour over cake; spread evenly over surface, working back and forth to fill holes. (Some filling should remain on top of cake.) Refrigerate 1 hour. In large bowl, mix whipped topping, food color and peppermint extract. Spread evenly on top of cake. Sprinkle with chopped cookies. Store covered in refrigerator. 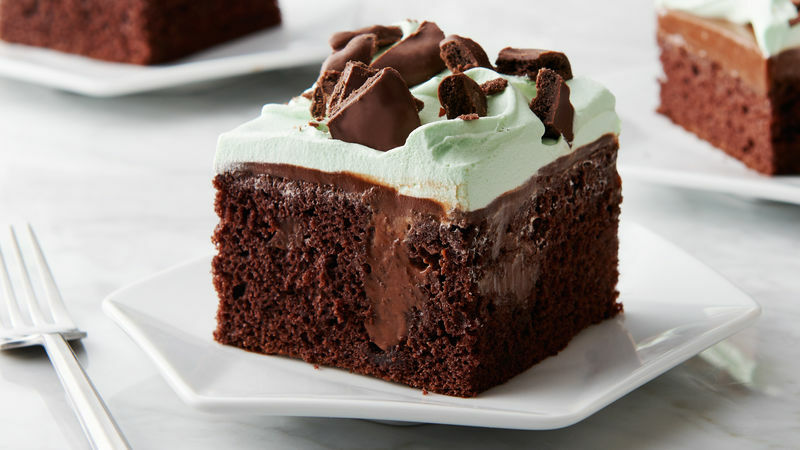 Peppermint extract gives a lovely mint flavor to both the filling and the topping for this cake, but it has a strong flavor, and a little goes a long way, so measure carefully. Make sure to spread pudding over cake immediately after mixing. It will continue to thicken as it sets and will be difficult to spread.